Planning a baby shower is tons of fun for all involved; that is, until you start seeing all those receipts start piling in. When it comes time to be budgeting out your baby shower checklist: Invitations, Food, Decorations, Supplies, etc., you’ll notice things start to add up pretty quickly! 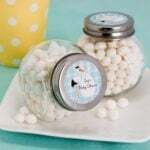 Baby shower favors, gifts, souvenirs- call them what you will, but they cost money. 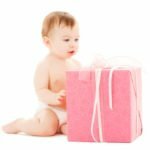 So, how can you save money and still give a really special gift to your baby shower guests? A great way to cut down the costs of planning a baby shower is to do the work yourself. Make your own baby shower invitations, whip up delicious snacks you found on Pinterest, decorate with clever DIY table centerpieces, and even make your own homemade baby shower favors! My favorite part of this idea is that whatever you make, can’t just be purchased. It’s special and you took the time to make something special for your guests. 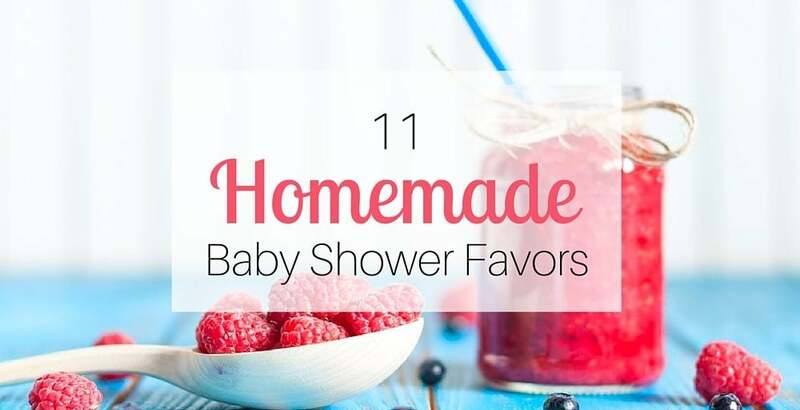 There are lots of fun, creative homemade baby shower gifts for guests you can make. Some are a bit more time intensive, and a few are just plain, cheap and easy baby shower favors! Here are a few of our favorites! Homemade Jam – A batch of strawberry jam poured into mini mason jars, topped with a decorative fabric square, and finished with a bow, will be the easiest homemade favors you’ve ever made, and your guests will love ’em! If you want a fun little twist on this idea, then why not make some homemade pepper jams? Bring a little heat to the party! The fun part of this idea is that many people have never tried pepper jam, so it’ll leave a memory, for better or worse! Themed Cupcakes – Lots of party stores carry themed baking supplies and decorating materials for cupcakes, like cute themed cupcake liners and sprinkles. 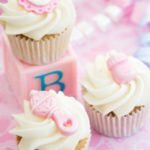 Baby shower cupcakes can be places in little bakery boxes, tied with ribbons, and given out as guests leave. Cake Pops – Yay Cake Pops! These yummy little treats are one of my favorite new homemade baby shower favor ideas! Dip your cake pops in white and milk chocolate and drizzle with white chocolate mixed with food coloring to match the shower theme. Interested? Check out our easy tutorial for how to make cake pops! Cookie Buffet – If you really like to bake, you can bake different kinds of homemade cookies (chocolate chip, peanut butter, chunky chip, etc.) and place them in individually-labeled platters or jars. Guests get their own bags or containers and they pick which cookie flavors they want. Cookie Mix In a Jar – Start with one of your favorite cookie recipes and empty canning jars. Layer ingredients in the jar one at a time, lightly tapping it on the counter after each to help ingredients settle. Finish with a cute fabric square, label, and ribbon with a bow. Scented Bath Salts – Treat your guests to their very own spa day with homemade bath salts made especially for them! Check out this homemade bath salt tutorial from MarthaStewart.com. Bath Soap & Lotion – Did you know you can also make your own soaps and lotions? You can find soap and lotion making kits online like this one from Amazon. Lip Balm – Another great homemade baby shower favor you can make yourself! There are recipes all over the web, but we like this one best because it’s so simple to make! Beaded Jewelry –Stringing your own blue or pink beaded bracelets, necklaces, and earrings is a fun way to commemorate the day! You can either make it an activity to do during the shower, or make the jewelry ahead of time for guests to take home. Mini Floral Arrangement – You can find inexpensive mini vases at various craft stores and decorate them with baby themed details or painted polka dots and each guests’ name. Matching real or silk flowers will finish off your mini arrangement. These are dual-purpose favors, as they can also serve as baby shower decorations! Hot Cocoa Kit – A super cute idea that doesn’t have to cost a lot to put together! Fill inexpensive coffee mugs with a packet of hot cocoa mix, a package of mini marshmallows, and some Hershey kisses to finish it off!